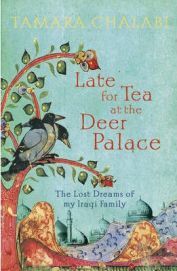 Late for Tea at the Deer Palace by Tamara Chalabi charts the history of the authors Iraqi family through the twentieth and early twenty first centuries. She starts with her great-grandfather, then her grandparents and their children, her father and his siblings. As a prominent family and opponents of the regime which overthrew the royal family, the Chalabis, a Shi’a Muslim family, were forced into exile in the late 1950s, moving to London and then Lebanon. Only once Saddam Hussein was removed from power could they return to their beloved Iraq. While the name Iraq may conjure up many thoughts and images these, they all boil down to one thing: war. All I know of Iraq is war, Saddam and death. This is a simplistic view, but it’s all I have been exposed to of the country – and I am sure many people are the same. When I started reading Late for Tea at the Deer Palace, it was like I was reading about some other country entirely: the Iraq of the early twentieth century was brightly colourful, cultured, intelligent, and sounded beautiful. This was completely at odds with what I knew – of course Iraq had a history before Saddam came along, but it had never occurred to me to consider that history. Throughout the twentieth century, Iraq had many political changes and occasional periods of instability. These are covered well by Chalabi, not in so much detail that her family history becomes bogged down, but with enough information to give a good grounding in and understanding of the politics. It would be impossible for her to tell her family’s story without this information, as they were so involved in Iraq’s political scene as a leading Shi’a family. It was fascinating to learn more about this country which we associate with negative images now, and I particularly enjoyed reading about the early part of the twentieth century, up to the 1930s, and learning not only about the politics and business of the family, but also learning about the country’s people and customs. The book paints a rich picture of a country with a rich history. The book is written in a mixture of historical and novel-like styles. Chalabi moves between these effortlessly, so she goes from detailing political change to recounting dialogue between her grandparents. The use of dialogue adds a very personal touch to the story, and gives the reader an attachment to the “characters” which is not always possible in a strictly historical piece of writing. In addition to the dialogue, many small personal details are given – about the family’s routines, possessions and leisure time, for example. Although the book moves through time, the pivotal characters for me were Chalabi’s grandparents, Hadi and Bibi. We meet both as children not long before their marriage, and even though they both died in the late 1980s, they are very much a presence in the book right up until the end, in the present day. I found that Chalabi’s writing about the couple made me grow really attached to them, even though she is open about their flaws; she clearly loved them, and this comes across in the book. Even though I knew that time was passing, that Bibi and Hadi were getting older, I seemed to find myself surprised by the photos of them growing old as the book moved on – their characters, particularly Bibi’s, remained so strong through their lives that seeing them as a small elderly couple seemed odd. The photos were a nice feature of the book: unlike many non-fiction books which have sections of colour pictures at intervals through the book, Late for Tea at the Deer Palace has black and white photos printed on the same pages as the text, so that when you read about (for example) a particular street in Baghdad in the 1930s, there is a picture right there to pore over. This meant that I hadn’t forgotten the significance of that street before I got to the photo, or that I hadn’t seen the photo before reading about it. The photos are still good quality and perfectly clear; I did not feel that printing them like this detracted from them at all. Chalabi herself has s slightly confused identity. Born in Lebanon to an Iraqi father and Lebanese mother, she thought she was Lebanese until she realised how attached her family was to Iraq. The book is divided into four sections, and each of those starts and ends with a short chapter from Chalabi’s point of view, generally in the twenty first century, as she tries to understand her identity and also as she visits Iraq, seeing the reality of her family’s memories, having been unable to visit for much of her life. These are an interesting view of present day Iraq, but I didn’t really welcome these interludes, and I was so caught up in the story of the past that I didn’t want it interrupted by the present. Chalabi makes very little reference to herself during the main story, as she wasn’t present for much of it. However, following her birth in the 1970s, she starts bringing herself into the story in the first person – which of course is to be expected, but it was a sudden change and seemed odd after so many pages of a largely third person story. Late for Tea at the Deer Palace has left me pensive, and with mixed feelings. I feel guilty and ashamed for only knowing the recent history of Iraq; I feel glad at having read the book as I enjoyed it. I don’t know if I want to read more about Iraqi politics; Chalabi has given me a good grounding in that, and it was the personal story of her family which captured me more. I feel sadness at what Iraq is today, and what has been done to that beautiful culture. It’s very hard to sum up what I think about Late for Tea at the Deer Palace – so I will simply say I highly recommend it, and suggest you read it yourself, and draw your own conclusions. Thanks to Harper Press for providing a free review copy. 2 Comments on "Late for Tea at the Deer Palace"
I was also sent a copy of this but didn’t read it yet because I knew you’d already reviewed it but now – after reading your review – I need to move it up my list. I’ve added the paperback to my wishlist – I’d love to read more about Iraq. I read and reviewed Talking About Jane Austen in Baghdad for the Bookbag last year, but I think that’s the only book about the country I’ve read.